Discussion in 'Masonic Education' started by Blake Bowden, Nov 13, 2009. Born Marion Morrison, "the Duke" appeared or starred in over 200 films in his fifty-year career, winning an Oscar for "True Grit," in 1969. Remembered for his definition of the American individualist of a mythical wild west, he came to represent America to several generations of movie-goers. A Member of Glendale DeMolay Chapter during his high school days, Duke was also a freemason, like his father before him, receiving his Craft degrees in July 1970 in Marion McDaniel Lodge No. 56, Tucson, Arizona. A Senior DeMolay, he was also awarded the DeMolay Legion of Honor in 1970. In December of that year, he joined the York Rite Bodies in California and became a Shriner in Al Malaikah Shrine Temple. I was initiated into the Order of DeMolay in April of 1980, soon after John Wayne was called from labor. The class into which I was initiated was a class named in his honor, and I received a document from DeMolay to that effect. In later years, when my chapter moved to a different lodge, we renamed it John Wayne chapter. That chapter has recently moved to Alvin Lodge, where it is hoped the chapter will grow again. Anson Jones #1416, A.F. & A.M.
Jack Halterman, Sr., Co-Founder of Los Angeles Fraternal Supply Company, shaking hands with Bro. 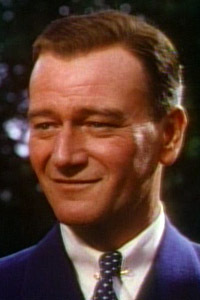 and Noble John Wayne in the early 1970's.